Rally Day, which lands this year on September 18, is a special day at the beginning of fall when we reunite, recharge, and reengage as a congregation. On the surface, this means one really fun Sunday to be at Advent with a lot of people, decorations throughout the building, and a big party with activities, crafts, and games — but Rally Day is all that, and more. The name "Rally Day" has been used for decades by Lutheran congregations to describe a powerful day that “rallies” the congregation back into community and ministry after the summer. 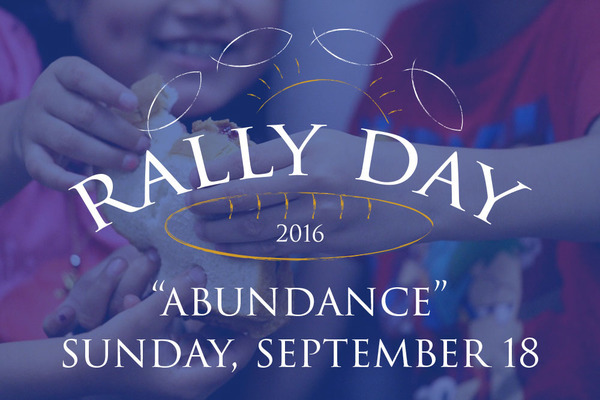 This fall we are aiming to live out Rally Day in the full breadth of its meaning. While in the past we have primarily thrown a kick-off party for Sunday School on Rally Day, this year we are making Rally Day something bigger that has something for everyone: children, teens, and adults! Why is it important to be at Rally Day? We truly hope you'll be present with us for Rally Day on Sunday, September 18. This is a meaningful day in the life of our congregation, a vital moment for us to launch back into community and ministry together. Let’s start this fall with energy, fun, togetherness, and purpose! For a visitor or friend, this is also an ideal day to see the full energy, diversity, and vibrance of our community here at Advent in a fun, engaging setting. In the last couple e-letters we've begun exploring our theme for Rally Day, asking what the secret is to seeing and feeling the abundance in our lives, and maintaining this "abundance mindset." We believe one answer lies in the power of community. By discussing and exploring abundance together, we can support each other in staying joyfully aware of the abundance and blessing in each of our lives. This is what we hope to spark September 18 on Rally Day. In each activity station at the Rally Day Party from 10-11am, we'll explore the idea abundance together as a congregation in fun and engaging ways. What's happening on Rally Day? 10-11am | Rally Day Party for families and adults Beginning in the basement fellowship hall, come explore a plethora of abundance-centered activity stations (for children, teens, and adults), and enjoy food and fellowship as a community. Activities will involve seeing, touching, making, talking, hearing, and playing, and will cover a wide variety of topics, including: water distribution, community feeding ministries, novice gardening, biodiversity, behind-the-scenes worship artifacts, social activism and more. You will also have the opportunity to learn about and connect with all our groups and ministries by visiting ministry-focused activity stations, chatting with any of our ministry leaders, and getting our updated "Ministries of Advent" booklet. 12pm | Rally Day “After-Party” Ministry learning stations from the Rally Day Party will remain open to explore after 11am Worship or before 12:45pm Worship. Who can help with my Rally Day questions? 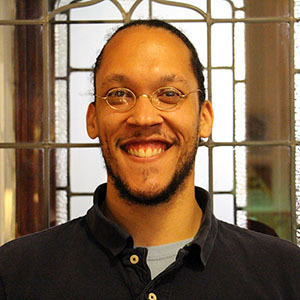 Zachary Stevens-Walter is our new Office Administrator and Sunday School Coordinator, and the principal coordinator of Rally Day. He will be able to answer all of your questions and can be found at worship Sunday mornings, in our office 9am-5pm Tuesday through Saturday, and contacted at admin@adventnyc.org or 212-665-2504. Pastor Ann, Pastor Mills, and our Communications Coordinator, Kevin Bowen, will be able to answer most of your questions as well. Can I help with Rally Day? Yes! There are many ways you can help with Rally Day, like decorating spaces, leading an activity station, bringing refreshments, and more. Contact Zachary at admin@adventnyc.org or at 212-665-2504 to let him know you’re interested in helping out. See you at Rally Day, September 18. Join our choir, the Advent Chorale. The Advent Chorale will have its first rehearsal after summer break at 7:30pm Thursday, September 8. If you're interested in singing in our choir this year, email director Aaron Wunsch at aaron@adventnyc.org to get started. More information about the Advent Chorale can be found here. Gospel Text | Luke 14:25–33: Jesus explains the cost of being a disciple. Adult Conversation | 10am in the basement fellowship hall. Pastor Ann will lead a discussion on the day's readings.